Dog agility is not your ordinary sport, but it's one that you and your dog can share. If you haven't yet watched a dog agility trial, you don't know what you're missing. Think of it as the doggie Olympics, and you'd be on the right track, because the dogs who compete and excel at these sporting events are highly trained and conditioned athletes. The goal in any dog agility competition is simple; be the fastest canine/handler team to complete the course without any disqualifications, and considering the fastest time at the 2006 AKC National Agility Championship was 30.81 seconds, achieved by Border Collie Sterling and his handler Jerry Brown, we do mean fast! 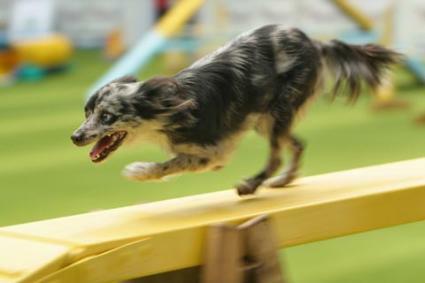 An agility course is rather like an obstacle course with standard elements that each dog must pass through in order to complete the run and receive a qualifying score. If a single element is missed, the team is disqualified. Let's look at the basic elements. The Weave Poles are a series of thin poles attached to a straight plank base. The dog must enter the weave at the first two poles and pass through the space between every pole in quick succession. It's truly amazing to watch a dog moving left and right at breakneck speed on its way through the poles and then buzz off to the next element its handler is directing it to. The A Frame is a ramp with a strong incline and equal decline. The ramp is colored with contact zones where the dog's feet must touch to assure it is fully using the element and not just jumping it. The Teeter is a long plank on a fulcrum that each dog must mount at one end and walk across to the other end. The dog must pause momentarily until the opposite end of the teeter touches the ground before it can dismount and run to the next obstacle. The Tunnel is a long tube each dog must run through. The Chute is similar to the tube at the entry point, but the rest of the chute is simply nylon without the hoops to support it, so dog are basically running blind through this element. Jumps are the same as you would find at an obedience trial, and the pole height is set according to the size of the dog. The Tire is suspended on a frame and each dog must jump through it on its way around the course. The Dog Walk is another type of ramp. The dog enters at one end on an incline, runs along a narrow, but level plank and then takes the decline back to the ground. Dogs are divided into one of five classes based on their height measurement at the shoulders. This gives each dog a fair chance to compete against its equals, so there will be five winners of the competition at the end of the day. While there are dogs of many breeds that compete in agility competitions, there seem to be a few breeds that really shine in the sport. The Border Collie is by far the dominant breed in the sport, practically owning the twenty-four and twenty-inch divisions. You'll even find smaller specimens in the sixteen-inch category, but here they run into some stiff competition. The Shetland Sheepdog is the star of the sixteen-inch division, with smaller specimens sometimes showing up in the twelve inch category as well. The Papillion is one of the fiercest competitors in the twelve-inch division, though again, you'll also find smaller Paps down in the eight inch division. The Parson Russell Terrier, formerly known as the Jack Russell Terrier may have shorter legs, but this little dog knows how to cover the territory in a flash; its exuberant nature finally finding a proper outlet for all that energy. Watching dog agility can be infectious, and you may soon find thoughts of competing in your own head. If you and your canine companion are interested in giving dog agility a try, contact your local kennel club or check the internet for training clubs in your area. Then buy yourself a sturdy pair of sneakers, because you're going to need them!